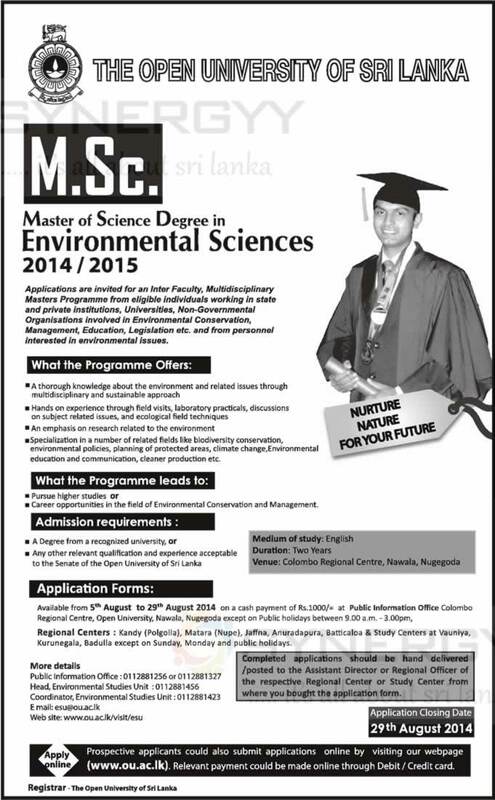 Applications are invited for an Inter Faculty, Multidisciplinary Masters Programme from eligible individuals working in state and private institutions, Universities, Non-Governmental Organisations Involved In Environmental Conservation, Management, Education, Legislation etc. and from personnel interested in environmental issues. Specialization in a number of related fields like biodiversity conservation, environmental policies, planning of protected areas, climate change, Environmental education and communication, cleaner production etc. Regional Centers : Kandy (Polgolla), Matara (Nupe), Jaffna, Anuradapura, Batticaloa & Study Centers at Vauniya, Kurunegala, Badulla except on Sunday, Monday and public holidays. Completed applications should be hand delivered /posted to the Assistant Director or Regional Officer of the respective Regional Center or Study Center from where you bought the application form. 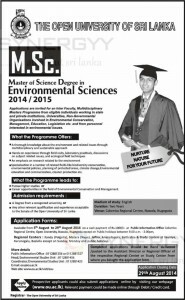 Prospective applicants could also submit applications online by visiting our webpage www.ou.ac.lk and Relevant payment could be made online through Debit / Credit card.